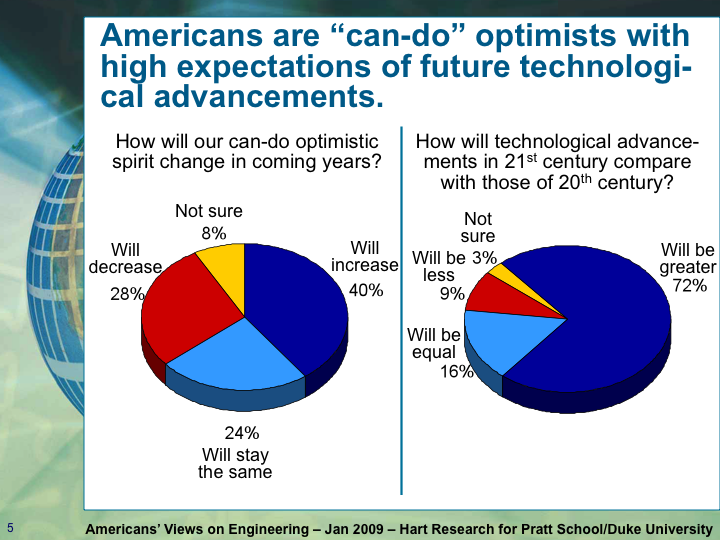 Duke University’s Pratt School of Engineering commissioned Hart Research Associates to survey Americans’ attitudes toward engineering in general and its potential role in solving the world’s most pressing problems. The scope and direction of the survey’s questions were guided by Duke’s Thomas Katsouleas, dean of engineering; April Brown, senior associate dean; and Deborah Hill, director of communications. 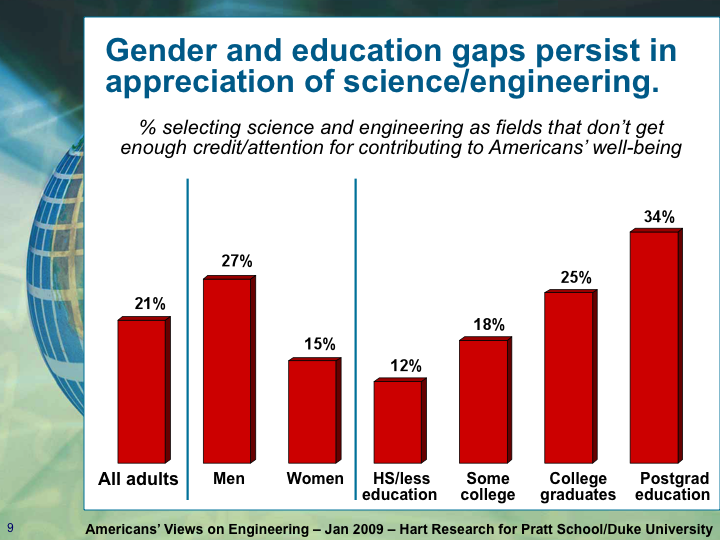 The poll finds that Americans largely take for granted U.S. supremacy in science and technology, having little understanding or appreciation of the role that engineers play. They do, however, recognize that many of the specific challenges confronting engineers are central to the problems of our times. Alerting Americans to engineers’ involvement in these types of challenges leads to markedly higher appreciation of the profession. [Full Report pdf]. This information was presented publicly by Peter D. Hart at the Summit on the NAE Grand Challenges on Tuesday, March 3, 2009. 1. Americans have high expectations of the 21st century’s technological advancements and of America’s leadership in meeting future technological challenges. Nearly three in four (72%) adults believe that the 21st century’s technological advancements will be greater than those of the 20th century, and nearly nine in 10 (88%) feel that the 21st century’s technological advancements will at least equal those of the 20th century. 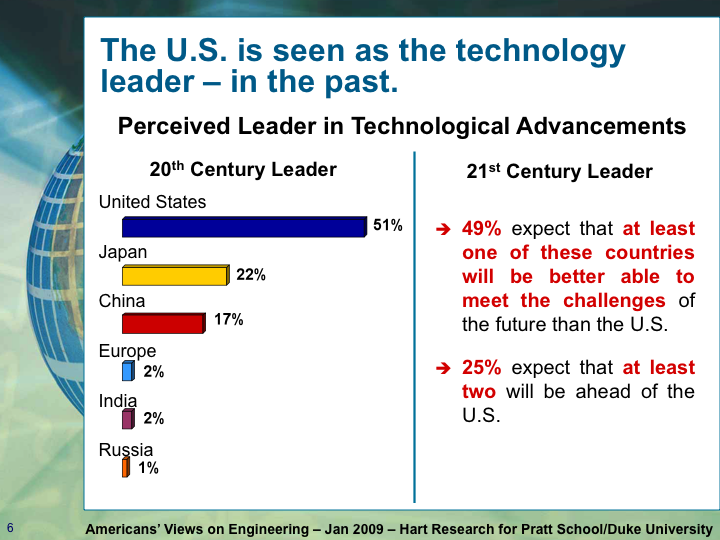 Mirroring the perceived dominance of the United States during the 20th century, half (49%) of Americans think that the United States will be the technological leader in the present century—ahead of Japan, China, Europe, India, and Russia. In judging America’s leadership position, less-educated Americans are more optimistic than are better-educated Americans about the nation’s relative position in the 21st century: 58% of adults with a high school education or less think that the United States will be the technological leader, versus 45% of adults with at least some college education. Similarly, less-educated Americans are more inclined to believe that the nation’s ability to compete technologically has improved over the past generation (44% for adults with a high school education or less, versus 31% of adults with at least some college education). Adults who believe that America’s ability to compete technologically has declined over the past generation most often attribute this to the education system. 2. Despite their high expectations for the future, most Americans are disengaged from the world of engineering and what it takes to advance technologically. American adults admit to having little familiarity with the realm of engineering, giving themselves an average grade of “C” for how much they know and understand about the world of engineers and what they do. This grade drops to a “C minus” for non-college-educated adults, while it rises slightly to a “C plus” for adults with at least a college degree. These grades are reinforced by the 21% of all adults who name science and engineering as the profession receiving too little attention and credit for Americans’ well-being—a proportion that drops to 12% among adults with a high school education or less. 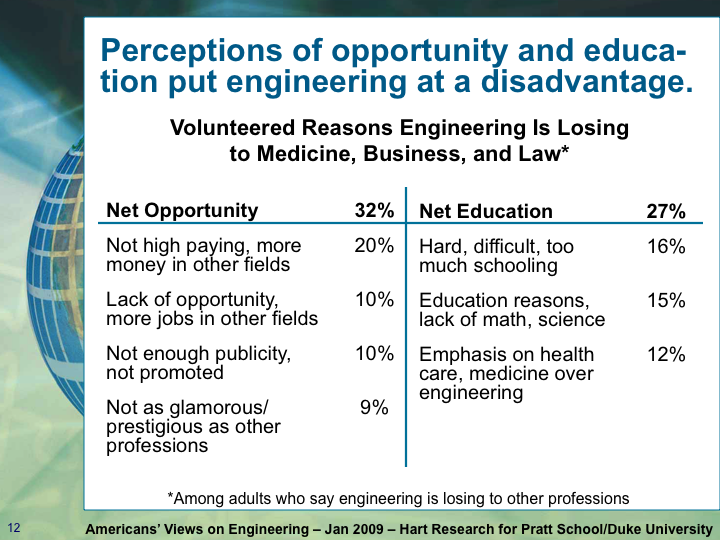 Most adults view engineering as less appealing to young people selecting a profession or career, compared with other professions, such as medicine, business, or law. 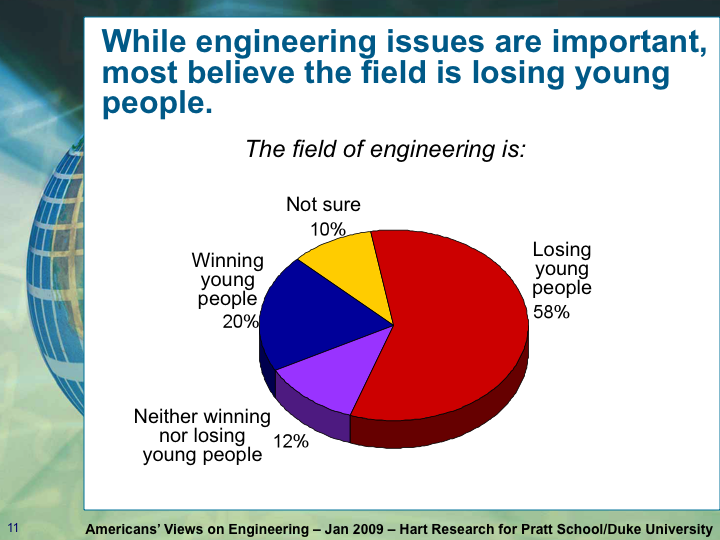 Nearly three in five (58%) adults feel that engineering is losing out to these other professions. Reasons cited for engineering’s relative lack of appeal relate both to education issues, such as a demanding curriculum, and to low pay, low prestige, and few job opportunities. 3. 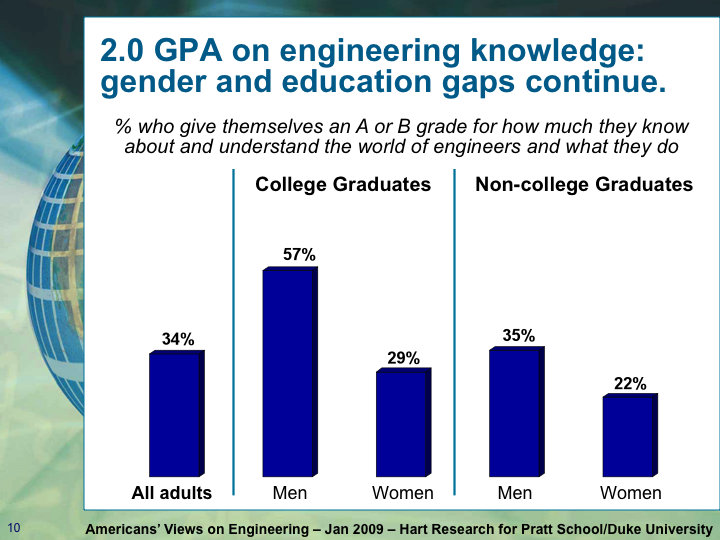 An alarming disparity exists between Americans’ views of the challenges ahead and the role that engineers will play in addressing them. While most adults are impassive toward engineering as a profession, majorities characterize the five engineering challenges presented to them as either high priorities or absolute top priorities for the nation going forward. Challenges judged to be the most important deal with life’s basics: fighting disease, providing clean water, and supplying clean and affordable energy. Securing cyberspace and restoring urban infrastructures rank as second-tier priorities. 4. The interest and importance Americans assign to engineering grows dramatically when they learn about the challenges engineers are addressing. 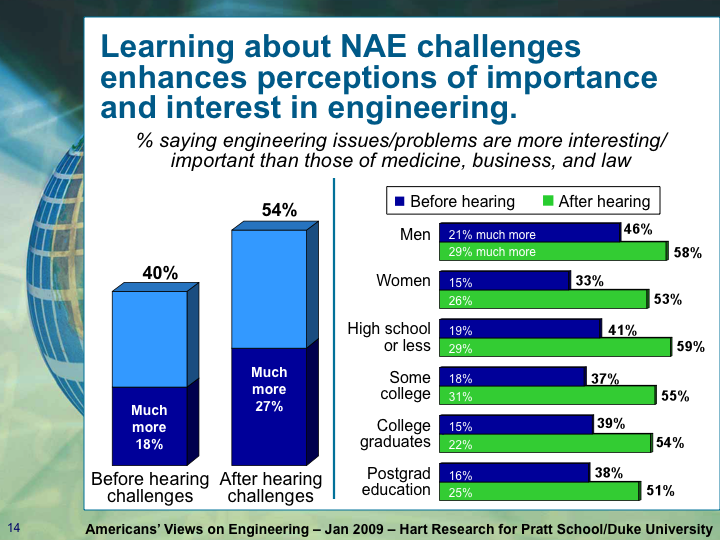 Before hearing descriptions of the five engineering challenges, 40% of adults judge engineering issues and problems to be more interesting and important compared with those associated with medicine, business, and law. After hearing the descriptions, the proportion increases to 54%. Demographic groups exhibiting the greatest increases include women without a four-year college degree (+24 points), African Americans (+22 points), and 18- to 34-year-olds (+21 points). 5. Focusing on specific engineering challenges, Americans recognize that other countries rival the United States for technological ability. believe that at least two other countries are better able to succeed than the United States in meeting these types of challenges. 6. 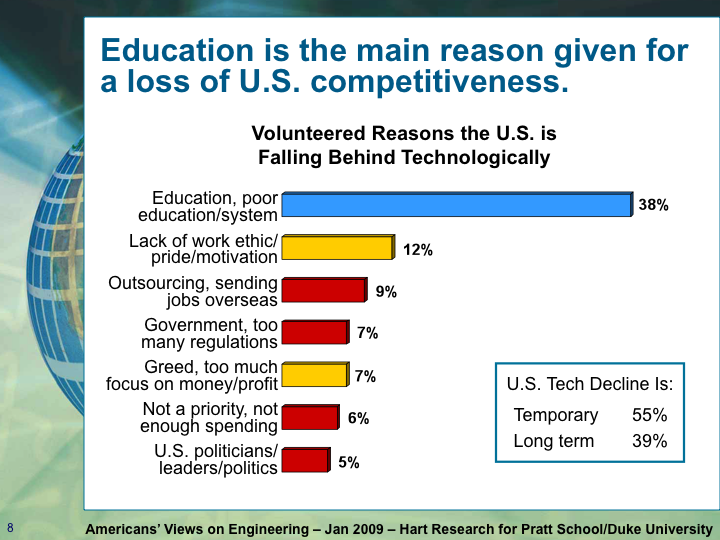 The ability to regain our global competitiveness in engineering and technology starts in the classroom. Given a list of suggestions for how America could improve its global competitiveness in the areas of engineering and technology, Americans favor those that go directly to the issue of increased training and higher education standards. Less direct solutions—including tax breaks, visa and immigration reform, and lengthening the school year—garner less enthusiastic support.